This superfood smoothie bowl is the best and easiest way to turn a drink into a healthy, balanced and colorful breakfast meal! As much as I like smoothies on their own as a drink, having it as a breakfast bowls has quickly become my favorite way. Loaded with healthy goodness, rich and totally customizable, there’s everything to love about smoothie bowls! You can keep it simple or be creative and add as many ingredients as you like, let your mood and the seasons inspire you. This Superfoods smoothie bowl is packed with tons of antioxidants, vitamins and protein, all necessary nutrients for a healthy body. It will boost your energy up for the day, and also secures you 2 of your 5 a day. More importantly, this superfood smoothie bowl is totally vegan / dairy free / gluten free, so everyone can enjoy it! 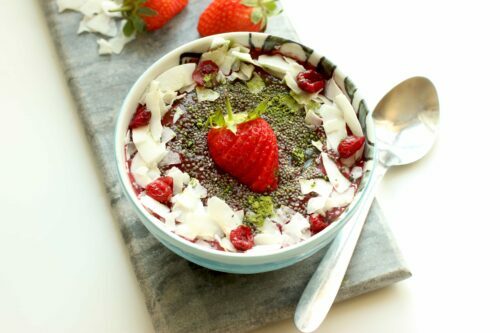 To make this strawberry smoothie bowl, I’ve used frozen mixed berries, almond milk for the smoothie base and crunchy & sweet coconut flakes, a bunch of dried cranberries, chia seeds and Matcha green tea for the toppings. It’s over-loaded with health benefits and will keep you nicely filled until lunch ( although I always have a mid-morning snack!). You can of course customize your bowls with your favorite ingredients: toasted almond flakes, pumpkin seeds, raspberries, blueberries, banana, goji berries, kiwi,mango, pineapple, cocoa nibs, granola and nut butter are a just few ideas for toppings. Add your favorites and start the day at the very (berry) best! This Superfood smoothie bowl is packed with antioxidants, vitamins and energy. Vegan, GF and delicious. Mix all the smoothie ingredients together in a blender, until smooth and creamy. Pour into a bowl and top with the remaining ingredients.